Narrative structure is a concept that is familiar to all of us from an early age. We understand at least on a superficial level that a story has tension, plot twists, rising and falling action, and a climax where the tension accumulates and releases either in triumph or tragedy. We can see Aristotle’s narrative structure in virtually every popular dramatic story in our culture. Take for instance The Wizard of OZ. 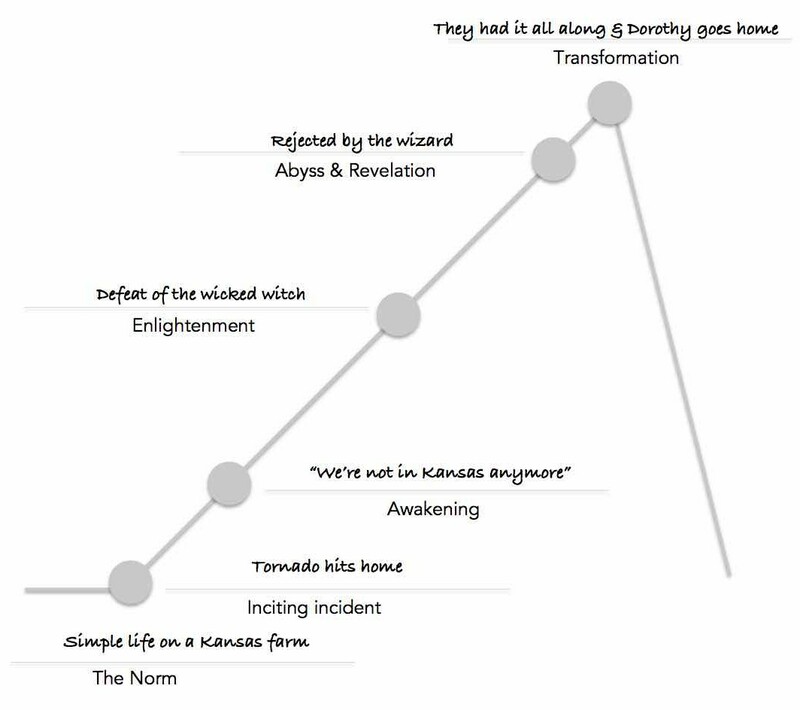 Using the figure below, we can see how the story evolves at each turning point to the final climax when the transformation occurs. Certain elements of story telling are so ingrained in our culture that we often assume that they apply to our own lives. This is a mistake because while in a story a climax is frozen in time, in life a climax is ephemeral. When we are unable to capture a climactic moment in stasis, it seems a disappointment. We wonder why that euphoria from crossing the finish line fades rather than setting the tone for the rest of our lives. We may even see it as a failure somehow, blaming ourselves or someone else for not living up to the rules of fairytales. This is a tragic misunderstand of the evolutionary nature of living. 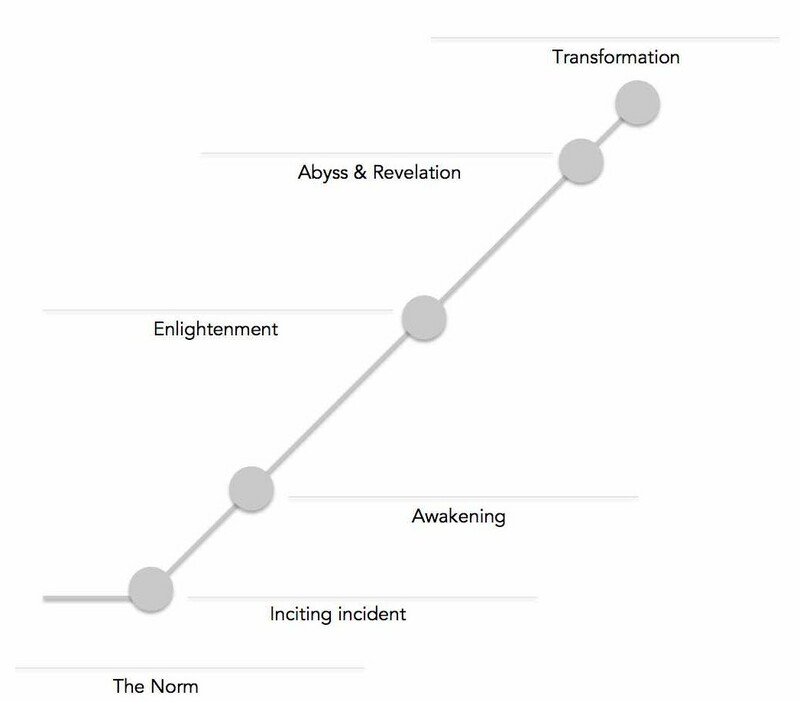 It is not about reaching a pinnacle, but rather a sequence of transformations. To help illustrate this, consider how you would complete a story arc for your true-to-life story. It’s up to you to determine timeframe and where you currently are on the arc. You could start the story from a very early age or from just a few months ago. You may have lived only up to the enlightenment turning point, or you may have lived through the climactic moment. Whatever the case, identify all the plot points that will allow you to tell a compelling story about your life. The next image illustrates why assuming our lives work like a story is problematic. 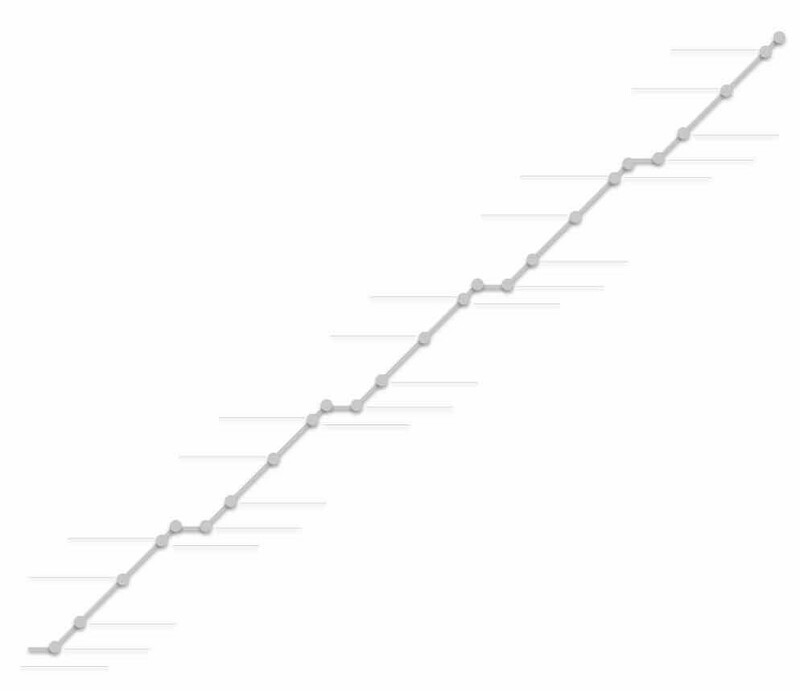 It shows a chain of story arcs like the one you just used to plot your life story. The arcs shown here are connected from beginning to climax. With the realization of each climax, a new storyline begins. When a transformation or climax is complete, it signals the denouement or closing of the story. In life, however, achieving transformation establishes a new baseline from which a new story grows. Life does not fall neatly along the plot points of a single story arc leading up to one climactic moment. It is a series of stories, in which we strive to and through one transformation to the next. To envision a happily ever after moment for your life not only hopes for the unattainable, it diminishes the grand scope of life. Life is not a fairytale. It’s infinitely better than that. When we reach a climactic point in our lives, that’s not the end. That’s the beginning. From there we continue our journey. We hit new obstacles, new adversaries, new crises, and we persevere. We continue to build our story and reach new heights. Plotting a major achievement along a narrative arc can be instructive in several ways. It helps the envisioning process and allows you to identify milestones, objectives, and challenges in a way that is encouraging rather than intimidating. Moreover, it is instructive for developing a way to tell a story about your personal goal that is compelling and interesting to other people. The mistake people can make in exercises like this, however, is the same mistake many make when setting goals in general. They picture the goal as a cinematic climactic event and thereby assume a scenario suspended in time rather than an achievement that will garner even greater achievements. Try this exercise one more time. This time, understand it for what it is: envisioning your next great achievement that will be the beginning of a new story for you. How will you tell this story to other people? How will you make it compelling and interesting for them as they listen to this story? Thank you. This is helpful. I think I often make this mistake in thinking about my life.